“Dude you’re just gonna be driving drunk people around all the time,” said a friend when I told him I was going to start driving for a major ride hailing company. Indeed, the vast majority of friends I told about my newest side gig had the impression that ride share was for people who wanted to party or go to the airport. But in just over a month of experience, I can promise that is not the case. A strong majority of my passengers have been people that don’t have access to a car. People that, in the past, would have had to rely on mass transit. But in a city (ahem, in a nation) with an inadequate transit system, ride share companies like Uber and Lyft are often the only “practical” bridge between car-less individuals and their jobs. After nearly a decade of encouraging transit ridership trends, a drastic decline in the last four years has led many to question about whether substantial investment in public transportation is warranted going forward. Across the country, transit ridership is down approximately 7% since 2014. Upward economic trends, higher percentages of car ownership, remote employment and the success of ride hailing companies have all been credited as reasons for the spiraling ridership numbers. In the two images below, the top graph displays U.S. Median Household Income, while the bottom graph shows U.S. Transit Ridership. The correlation between the two from 1990 to 2014 is shockingly strong, suggesting that transit ridership actually increases as the economy improves. The trend seems to point to the idea that the better the economy, the more people of all socioeconomic backgrounds go to work using all forms of transportation, including public transit. But in 2014, after 24 years of correlation, transit numbers plummeted in contrast to a surge in median household income. This suggests that there is an alternative influence at work that is pushing against transit ridership numbers. 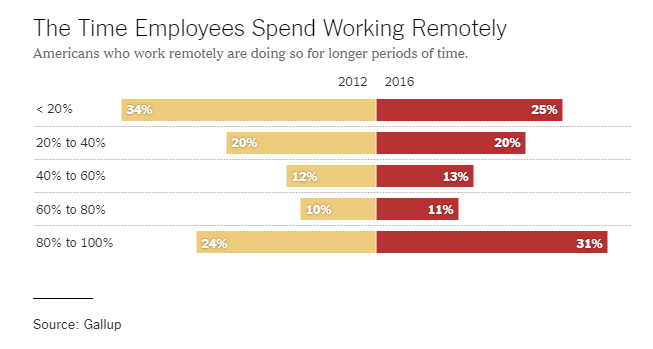 More Americans are working remotely than ever before. A 2017 New York Times article shows that more people are working remotely across a variety of different industries, and are doing so more often. The piece explains that in 2016 “43 percent of employed Americans said they spent at least some time working remotely” and that this “represents a four percentage point increase since 2012.” A rise in remote employment of just a few percentage points can have a significant impact on transit usage. With the improving economy, more people are buying cars today. According to an Automotive News article (citing data from The University of Michigan Transportation Research Institute) car ownership is at its highest point since 2006/2007. The report states that 2013/2014 saw a steady increase in car ownership nationwide after nearly a decade of decline. More people behind the wheel likely means less utilization of alternatives, though increased car ownership alone does not seem to be enough to account for the significant downturn in mass transit utilization. 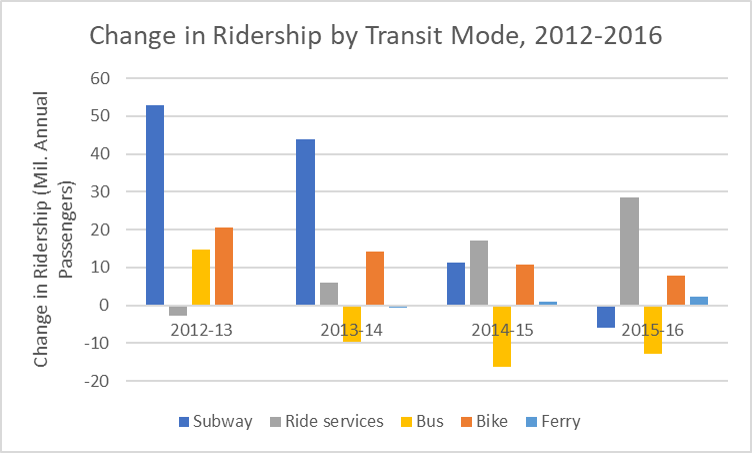 When looking at data and variables that commonly influence transit, it becomes clearer that there must be a new variable that is significant influencing the sudden and rapid decline of ridership. Enter Uber and Lyft. Launched in 2009 and 2012 respectively, the two ride hailing titans appear to be the vacuum that is sucking passengers away from buses and trains. It is likely no coincidence that the beginning of app-based ride hailing’s popularity correlates very similarly to the abrupt decline in transit usage. An NYCEDC article features a graph that shows the staggering surge of ride hailing services (taxis, Uber and Lyft) and the simultaneous decline in transit ridership in New York City. In just a few short years, transit gains have turned to declines in the face of what appears to be a shift in the preferred mode of transportation in the nation’s largest city. Uber’s astronomical growth has seen ridership rise from 1 million passenger per day in 2014 to 5.5 million per day in in 2017. The impact of this meteoric rise on transit cannot be overstated. In fact, a UC Davis study found that once a person uses ride share, he or she is far more likely to choose ride share over public transit. It’s easy to have a grim perspective on the future of public transit as we look at the numbers from above. But while we’ve seen a 7% decline in countrywide transit ridership in the last four years, we must remember that leaves an enormous percentage of folks who still rely on the services of public transit every day. While data has shown that app-based ride hailing services are appealing more with people who have the means to make “transportation choices,” a huge majority of daily ridership cannot afford, or may not be in the position to, make that choice. Imagine you have 100 people waiting for a train to take them to work every morning. One of them has a better job due to a better economy and buys a car. Two people now work remotely most days. Finally, four more were running late this morning and have decided to use Uber to get to to work on time, or maybe they just didn’t want to brave the elements. There’s your 7%. But if you’re on that platform, you probably don’t notice, because there are still 93 people that need to get to where they are going, and don’t have the means to make an alternative choice. Ride hailing is likely the biggest culprit in the drastic downturn of mass transit ridership. But Uber and Lyft cannot be the future of transit for all, nor can it affect the urgency with which we must improve public transit going forward, as a huge percentage of our population cannot afford to make this transportation choice. Furthermore, it is likely that many who do not have the means to utilize ride hailing services do so anyway because their local mass transit options are underfunded and inadequate. If we want to ensure upward mobility for those who rely on efficient, effective, and just as important, cheap bus and train service every day, we must provide leaner, more efficient and reliable transit choices for those who need it the most in our cities and across our country.